Sustainable Success Starts with Agile: Best Practices to Create Agility in Your Organization. While it might frustrate us when we can’t control it, change really should be seen as opportunity in disguise. Enterprises everywhere recognize that to turn opportunity into advantage, business and IT agility is more important than ever. Fifty-six percent of IT executives in a recent survey1 put agility as the top factor in creating sustainable competitive advantage—ahead of innovation. But creating true agility is hard. In the same survey, just one in four respondents said their enterprise’s IT was successful at improving and sustaining high levels of agility. Of the more crucial IT goals—optimization, risk management, agility and innovation—agility had the lowest rate of realization among enterprises. True agility in today’s Instant-On Enterprise involves reducing complexity on an application and infrastructure level, aggressively pursuing standardization and automation, and getting control of IT data to create a performance-driven culture. While the challenges are great, getting it right enables enterprises to capitalize on change by reducing time to market and lowering costs. Understanding the levers that affect cost allow your enterprise to be more nimble. For instance, if your business is cyclical, moving to a variable-cost model in IT can help sustain profitability even through a down cycle. 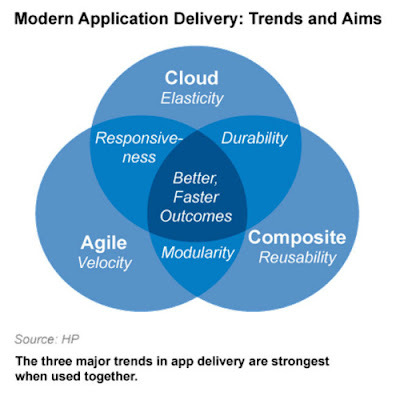 This gets to the heart of agility: delivering products and services faster. "Availability isn't a problem ... until it is. Then it's at the top of the CIO's agenda," says Macbeath. Being able to rapidly triage, troubleshoot and restore service is as important to agility as the ability to get the service deployed in the first place. In the merger of HP customer United Airlines with Continental Airlines, the faster the IT integration, the more significant the savings. Business agility starts with a holistic view of IT data, says Myles Suer, senior manager in HP Software’s Planning and Governance product team. "Getting timely access to data that allows you to drive to performance goals and then make adjustments when you don't meet those goals represents the biggest transformation possibility for IT," he says. For CIOs focused on transforming their business, the key is gaining access to accurate, up-to-date metrics that are based on best-practice KPIs. Trustworthy metrics let CIOs control IT through exception-based management and understand what it will take to improve performance. To achieve greater agility, look to three broad areas of improvement and put in place monitoring programs to track against performance goals. "That's the first step," Suer says. Ask yourself: What percentage of your applications run on standard infrastructure? How many sets of standard infrastructure do you have? "You want a standard technology foundation to meet 80 percent of your business requirements," says Macbeath. It may seem counterintuitive, but standardization makes a company more efficient and more agile than competitors. Standardization is also a prerequisite for automation. Public cloud providers aggressively pursue both. Taking the same approach for enterprise services means you can begin to realize cloud efficiency gains. "Agility is the inverse of complexity," says Macbeath. Your goal is to measure and reduce the number of integration points and interfaces in your architecture. The key is decreasing the number of platforms managed. Application rationalization and infrastructure standardization programs reach for low-hanging fruit, such as retiring little-used and duplicative applications and unusual, hard-to-support infrastructure. Longer term, your enterprise needs to tackle the more difficult task of reducing the number of interfaces between applications. Macbeath recommends driving to a common data model between applications. This reduces support costs and makes it faster and cheaper to integrate new functionality into an existing environment. This can be as simple as tracking help-desk response time, mean time to repair, escalations and so on. "Once you're systematically tracking responsiveness, you can move to a more sophisticated level of cost-to-quality tradeoffs," Macbeath says. In working with HP customers, Macbeath sees numerous examples of organizations that are successfully increasing their agility. For example, a European bank working with HP has established an online system to show internal customers exactly how much it costs for one "unit" of Linux computing to run an application at multiple service levels: silver or gold. "Retail banking is a very cost-competitive business," Macbeath says. "Allowing internal customers to see the cost-performance tradeoffs for themselves and have the numbers right there makes it possible for business and IT to work together to make decisions to benefit the business." Pursuing agility by way of automation let another HP customer, a global telecom company, reach new sources of revenue. Instantly deploying wireless hotspots provides a key capability for the company; by automating this process, IT was able to push out more than 40,000 new hotspots. The company turned on a new source of revenue almost immediately. Standardization and automation combined with measuring results to drive performance. Through this process, their IT departments are demonstrating greater value for the business while delivering greater speed and transparency. Extend the Principles of Agile to Deliver Maximum Business Value. The Agile movement has already helped thousands of IT organizations develop applications at light speed. But to maximize Agile’s impact on the business, you have to push its principles further throughout the enterprise until Agile delivery becomes continuous delivery, and continuous delivery leads to true business agility. 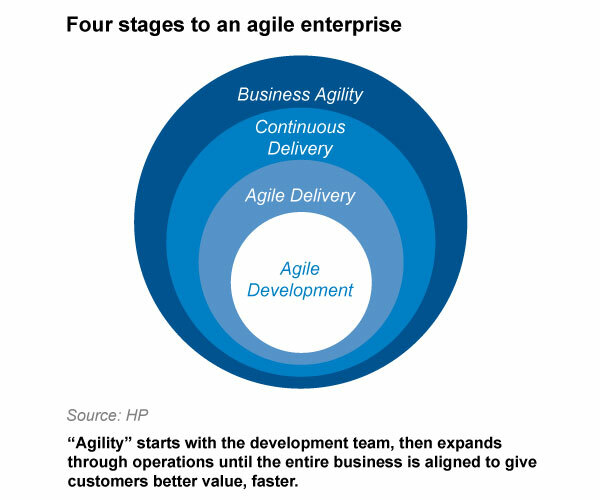 The four stages that lead from Agile development to the agile enterprise can revolutionize the way business value reaches customers’ hands. Agile initially emerged as a collection of software development practices in which solutions evolve incrementally through the collaboration of self-organizing teams. Because early adoption grew out of grassroots, developer-led initiatives, Agile matured first within the developer space. It manifested in practices designed to shorten the feedback loop and uncover problems earlier in the cycle so they could be addressed sooner. It made coders fast and flexible. In many IT shops that had been organized in traditional functional silos, testers initially stood on the sidelines and wondered what Agile meant for them. The effect was a pseudo-Agile process in which code was developed in iterations but then tossed over the wall for QA teams to test the same way they always had. The IT organizations that have had the best results with Agile have torn down the silos between development and QA to create truly cross-functional teams. To allow testers to keep up with the accelerated development pace and not sacrifice quality for velocity, they have revamped their approach to incorporate more robust test automation that can be run on a near-continuous basis. They have also adopted advanced techniques, such as service level (API) testing and exploratory testing to mitigate risk as early as possible. Many organizations adopting Agile today are at this level. But as Agile adoption continues to expand and leaders see the value it can bring to delivery, momentum is gathering to break down the next level of organizational silos. Agile delivery teams have made great strides, but what is the point of rapidly building new features if those features just sit and wait to be released? To capitalize on the advances in delivery and better translate them into business value, it’s time to extend Agile development principles to deployment. Continuous delivery, which is enabled by the DevOps movement, extends the Agile mind-set to incorporate IT operations. It focuses on what is ultimately important—shorter cycles for actually putting functionality in the hands of users. It relies not only on better collaboration between the two disciplines, but on comprehensive automation of the build, test and deployment process, so that—at the extreme level—every code change that passes automated functional, performance and security testing could be immediately deployed into production. This level of integration and collaboration between delivery and operations allows releases to be driven by business need rather than operational constraints. The best way to start moving toward continuous delivery is to begin embracing DevOps principles. Include operations staff in demo meetings and planning sessions, share assets (test, build and deployment) and automate as much as possible. Examine KPIs and incentives to ensure alignment across the two functions. You’ll know you’re making progress when you see overall cycle times, from idea inception to released functionality, decrease dramatically. Although few organizations have achieved this stage, it’s what all are aiming for. True business agility happens when the entire organization can continuously analyze results and adapt accordingly. Here’s how it happens: Deploying smaller increments more frequently not only puts features into the hands of the users at a much faster rate, but it also facilitates a steady stream of user feedback. User feedback lets you apply the Agile concept of “inspect and adapt” at the business level. It provides timely insight into shifting user preferences and helps you make precise course corrections and more informed decisions. Business agility requires more than just IT. Achieving true agility will require a cultural shift within your organization before you can fully take advantage of the opportunity it presents. Business stakeholders must be empowered to make decisions quickly without legacy processes—such as annual budgeting—standing in their way. Other functions, such as sales, marketing and customer support, also play vital roles and need to be tied in effectively. Which of your core business applications could benefit or gain differentiation from constant user feedback? What non-IT areas of your organization would need to be better integrated to get full, end-to-end agility? What legacy processes might need to be revisited and transformed? When you start to achieve more of the business objectives that drove your projects in the first place—increased revenue, faster ROI, improved customer satisfaction—you’ll know you’re approaching true business agility. At the Dreamforce conference, Salesforce.com (NYSE:CRM) CEO Marc Benioff unveiled the latest evolution of the company’s strategy and supporting technology for cloud computing and mobile technologies. Its aim is to enable businesses to engage with customers and prospects via social media channels – what Salesforce calls the “social enterprise” – and empower employee and customer social networks to operate individually and together. Note I did not mention CRM, which doesn’t have a role in this platform for basic interactions with prospects and customers and is accompanied by a large ecosystem of partners that provide dedicated marketing and contact center applications. As summarized in its announcement, Salesforce’s strategy is clearly different from that of others in the applications market, including Oracle and SAP, which have products for the cloud computing environment and have made strides into integrating collaboration and social media capabilities into their applications. Salesforce says significant technological improvements in the coming Winter 2012 release and later will make Chatter a true social business tool with many methods to chat, share, approve and otherwise enable the collaborative process. Another addition slated for Chatter is the ability to include presence information in the chat the way most instant messaging networks do today in a feature the company calls Chatter Now. Users will be able to embed and share video, graphics and other kinds of files. Users who have too much traffic in their feeds will be able to filter content based on keywords. Chatter Approvals will be able to handle prompted interactions. With Chatter Customer Groups users will be able to invite and interact with customers or external people in private discussion groups. Those looking to build custom enhancements to the software can employ the Chatter API using REST and streaming that can be embedded with Chatter to interact with applications. Last year iWay Software demonstrated third-party integration to take any systems event and publish it into a Chatter feed. The expanded capabilities for Chatter, and Salesforce’s enhanced profiles of customers and prospects, will be integrated with the Service Cloud in an application called Chatter Service to help improve customer interactions for contact centers. Chatter Service will also be able to integrate into Facebook. This could create a new class of customer self-service for organizations that want to move their initial interactions into social media, and move questions and comments into more formalized customer service channels for resolution. To address the full needs of a contact center though beyond social media will create other applications for which Salesforce has plenty of partners exhibiting including Contactual, inContact, Interactive Intelligence, Five9 and LiveOps. Salesforce showed how it can add value to the Sales Cloud with its advances in Chatter, but we do not expect to see a more integrated set of methods till 2012. Until then you can use Chatter by itself to interact with your sales team and the new versions will now be a good reason to evaluate them for what they call social sales. If you are looking to address the broader set of sales activities and processes beyond SFA, Salesforce has plenty of partners that should be considered if you care about efficiency and achieving sales quotas and targets. Salesforce.com’s social enterprise direction will require simpler access to applications from smartphones and tablets. The company has created an engine to transform its applications to operate in an HTML5 environment so they can be utilized on smartphones and tablets from Apple, Android devices, RIM hardware and Microsoft’s, too. Salesforce calls this its Touch approach and will release it sometime in the future. You can sign up to be notified when that happens with Salesforce’s Touch. This will be a significant new option for anyone operating in the Salesforce.com environment. One of the key pushes by Salesforce is database.com, which is designed to securely store organizations’ data in the cloud; it can be used by applications running on the company’s force.com platform for cloud apps as well as new social enterprise offerings that will come out in 2012. Our upcoming research in business data in the cloud will unveil more challenges and opportunity for improvement to support technology like database.com. This offering makes it easy to provision a database and get started. Its pricing and capabilities suggest that database.com is a transactional centralized data service. It’s not clear whether it will be useful for business analytics, which our research finds to be a major need in organizations today. Business analytics has not been one of Salesforce strengths which its customers can attest which is why the portfolio of partners providing these capabilities is quite significant. Many of them also depend on their own database technology for analytics that operates in the cloud. If database.com is not able to support the analytics needs within the database its potential and impact to its customers could be hindered. Salesforce.com makes the social enterprise interesting, and it is taking the lead in advancing these kinds of interactions, especially with business-to-consumer companies, which need the most help in dealing with social media. Its ecosystem of partners and the ability to integrate with consumer social media give Salesforce an early advantage in the market. If you are looking for new core applications in marketing, sales and customer service, you will need to invest in the partners to make this happen. It’s not easy to determine how to get the full value in your Salesforce.com investments, but it is worth the effort. If you are in sales or customer service departments or are trying to get a great mobile strategy, come and let us know as we can definitely help get what you need today. Organizations should take this social enterprise seriously, and especially those that see social media as essential to their future and Salesforce as well. Researchers combine a Kinect sensor with a pico projector to expand the possibilities for interactive screens. Hands-on "screen": A proof-of-concept system allows smart phones to use virtually any surface as a touch-based interactive display. OmniTouch works by bringing together a miniature projector and an infrared depth camera, similar to the kind used in Microsoft's Kinect game console, to create a shoulder-worn system designed to interface with mobile devices such as smart phones, says co-inventor Chris Harrison, a postgraduate researcher at Carnegie Mellon's Human-Computer Interaction Institute in Pittsburgh and a former intern at Microsoft Research. Instead of relying on screens, buttons, or keys, the system monitors the user's environment for any available surfaces and projects an interactive display onto one or more of them. OmniTouch does this automatically, using the depth information provided by the camera to build a 3-D model of the environment, says Harrison. The camera acquires depth information about the scene by emitting a patterned beam of infrared light and using the reflections to calculate where surfaces are in the room. This eliminates the need for external calibration markers. The system rebuilds the model dynamically as the user or the surface moves—for example, the position of a hand or the angle or orientation of a book—so the size, shape, and position of these projections match those of the improvised display surfaces, he says. OmniTouch "figures out what's in front you and fits everything on to it." The system also monitors the environment for anything cylindrical and roughly finger-sized to work out when the user is interacting with it, again using depth information to determine when a finger or fingers make contact with a surface. This lets users interact with arbitrary surfaces just as they would a touch screen, says Harrison. Similarly, objects and icons on the ad hoc "screens" can be swiped and pinched to scroll and zoom, much like on a traditional touch screen. In one demonstration art application, for example, OmniTouch used a nearby wall or table as a canvas and the palm of the user's hand as the color palette. The shoulder-mounted setup is completely impractical, admits Hrvoje Benko, a researcher in Natural Interaction Research group at Microsoft Research in Redmond, Washington, who also worked on the project, along with colleague Andrew Wilson. "But it's not where you mount it that counts," he says. "The core motivation was to push this idea of turning any available surface into an interactive surface." All the components used in OmniTouch are off the shelf and shrinking all the time. "So I don't think we're so far from it being made into a pendant or attached to glasses," says Benko. Duncan Brumby, a researcher at the University College London Interaction Center, in England, calls OmniTouch a fun and novel form of interaction. The screen sizes of mobile devices can be limiting, he says. "There's a growing interest in this area of having ubiquitous, intangible displays embedded in the environment," he says. And although new generations of smart phones tend to have increasingly higher-quality displays, Brumby reckons users would be willing to put up with lower-quality projected images, given the right applications. Precisely which applications is hard to predict, says Harrison. "It's an enabling technology, just like touch screens. Touch screens themselves aren't that exciting," he says—it's what you do with them. But the team has built several sample applications; one allows users to virtually annotate a physical document, and another incorporates hand gestures to allow OmniTouch to infer whether the information being displayed should be made public or kept private. 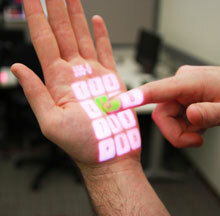 "Using surfaces like this is not novel," says Pranav Mistry a researcher at MIT's Media Labs. Indeed, two years ago, Mistry demonstrated a system called SixthSense, which projected displays from a pendant onto nearby surfaces. In the original version, Mistry used markers to detect the user's fingers, but he says that since then, he has also been using a depth camera. "The novelty here [with OmniTouch] is the technology," he says. "The new thing is the accuracy and making it more robust." Indeed, the OmniTouch team tested the system on 12 subjects to see how it compared with traditional touch screens. Presenting their findings this week at the ACM Symposium on User Interface Software and Technology in Santa Barbara, the team showed it was possible to display incredibly small buttons, just 16.2 millimeters in size, before users had trouble clicking on them. With a traditional touch screen, the lower limit is typically around 15 millimeters, says Harrison. "We are interested in the creative act of reflecting on the past," says Richard Banks, lead designer on the project. "Actually sitting down and spending time creatively thinking about the past by making a photo album or a timeline is very different to existing online content being ordered chronologically." 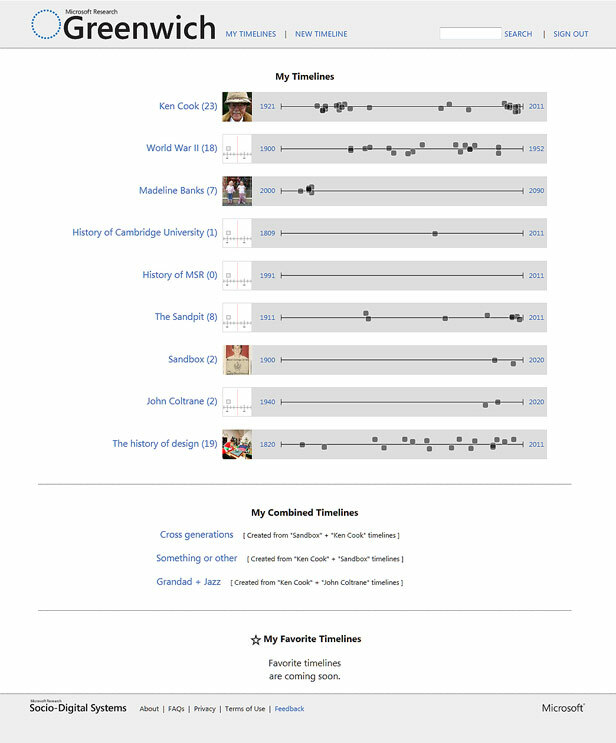 The website was provisionally called Timelines by its developers at Microsoft Research Cambridge, in England. This was hastily changed due to the similarity to Facebook's new Timeline feature, which allows users to scroll chronologically through pictures, updates, and event listings related to their lives or those of their friends. Facebook's format uses indicators such as the numbers of comments that content has attracted to automatically highlight key events. Users can also manually choose what should be included and left out. Banks, who is a principal interaction designer in the Computer Mediated Living group at Microsoft Research Cambridge, was partly inspired by a suitcase of around 200 photographs left by his grandfather Ken Cook, who flew bombers over Germany during World War II, on his death in 2006. As an example of what can be done using Project Greenwich, he has created representations of his grandfather's life merged with historical content on the Web about the war and the British Royal Air Force. "The ability to merge different timelines about, say, people and events creates interesting contrasts between authoritative and personal versions of events," adds Banks. Demand for BI as a means to get maximum value from information has never been higher as businesses increasingly compete in real time and require integrated information from across the enterprise. An old saw says BI gets "the right information to the right people at the right time." It's really time to add "via the right medium" to that mix. Automating business decisions is one path to BI maturity. Triggering actions automatically, based on changes in corporate data, can arise beneficially from a solid understanding of how decisions are made today. But we also know that many decisions are multifaceted, and a knowledge worker's analysis will continue to be a part of effective business intelligence. Effective analysis is getting more complicated for knowledge workers. The more involved aspects require understanding what is happening and combining that with summarized historical data to build a set of possible actions. These decision "analytics" are the basis of competitive advantage for organizations today. Once calculated, they are put to effective use, utilizing the best medium available for real-time delivery. Like water, information and analytics must flow through the path of least resistance, utilizing the deployment option that turns the information into valuable business action most quickly. The accepted paradigm of effective business intelligence must change. Once, BI was exclusively made of reports built by IT from overnight-batch-loaded data warehouses, which replicated a single or small set of source systems. Those reports were deployed to the personal computers of end users in what now seems, in hindsight, a very heavy-handed and resource- intensive process. Delivering a report to a user's personal computer on a regular basis is nowhere near the pinnacle of BI achievement. Shops still operating with this mentality are leaving tremendous value on the table. Today the norm for BI involves "zero footprint" Web-based delivery of reports. This improvement allows information to reach many more users. A parallel development is that, while the detailed transactional data is necessary to be accessible on a drill-through basis, it is the rapid availability of summary level information that activates the process. The majority of users have become more accustomed to a targeted presentation layer. Dashboards represent an advanced form of information delivery, second only to operational BI as a mature approach to disseminating information. Acting on dashboards that already have a certain amount of knowledge worker intelligence built in moves the organization to real-time competitiveness. When you add mobility to the picture, notifications take on a whole new utility. Notifications can be sent to mobile devices when the dashboard data changes - or, rather, changes in a way that is meaningful to the knowledge worker. Mobile applications provide useful notifications and remove email as an extra step in the process. Notifications, combined with the ability to immediately access the information wherever the knowledge worker is, provide many advantages over a dashboard, which requires Web browser technologies. If the past several years have brought a sea change in social culture, it is clearly in the use of mobile devices. What was once a phone for verbal communication has become a favored medium for email, Web access, music, podcasts, photos and information about weather, dining and travel. This has all happened in a short period of time and the trend will surely continue. As case studies attest, mobile devices and tablet computers are highly useful business tools. The flexibility that they offer to knowledge workers no longer tied to a physical location is now seen to be as necessary in business. Achieving real-time business mobility helps information flow like water through the path of least resistance. It facilitates less hunting and gathering on the part of the information consumer by delivering summarized information, supported by detail by BI systems. The biggest business factor driving the need for mobility is the real-time nature of new business needs. Out-of-stock conditions, customer complaints and fraud are not optimally solved with reporting. In order to address these issues, information cannot be out of date. Fortunes can be gained and lost by suboptimal business decision timing. Data warehouses built with a personal computer usage layer create a distinct challenge to the optimal timing of decisions. The preferred timing of intelligence gathering is during the immediate occurrence of a trigger event. Business is becoming a world where the players are always plugged in, and expect and need to make immediate decisions. Therefore, business units - and the systems they utilize for real-time decision-making - need high quality, high performing, corporately arbitrated information in real-time. For competitive parity, it is imperative that the information management function not only responds to business needs, but also brings solutions to the table in real-time and ensures that they are visibly exposed for decision-makers. Real-time information delivered to an abandoned desktop or to the Web that inherently involves multiple steps for the user to derive value does not exploit the potential of available on-time information. Businesspeople need easy access to accurate information delivered to them at any time or place. The answer is mobile BI, utilizing the mobile device as the data access layer. The expanding managerial movement to adopt analytics is being spurred by the needs for improved organizational performance and a sharpened competitive edge. Now that the benefits of applying analytics for insights and better decisions are being accepted, the next question is: How should an organization get the maximum yield and benefits from business analytics? A trend with applying analytics is a demonstration of “Carlson’s Law,” posited by Curtis Carlson, the CEO of SRI International in Silicon Valley. It states that: “In a world where so many people now have access to education and cheap tools of innovation, innovation that happens from the bottom up tends to be chaotic but smart. Innovation that happens from the top down tends to be orderly but dumb.” As a result, says Carlson, the sweet spot for innovation today is “moving down,” closer to the people, not up, because all the people together are smarter than anyone alone, and all the people now have the tools to invent and collaborate. A generally accepted way to drive the adoption of analytics is with executive team sponsorship and formally establishing a competency center for analytics. Unfortunately, the conditions are not always right for these. Executives are often distracted with fire-fighting or office politics. And creating a competency center requires foresight and willpower from executives, which can be a limiting factor. Leadership does not only exist at the top of the organizational chart. Leadership can be present in individuals below the C-suite positions. This is possible because a key dimension of leadership is the art of getting a group of people to accomplish something that each individual could not do alone. Leadership does not require formal authority and command-and-control behavior. There are hundreds or maybe even thousands of books and articles about leadership, yet some highly respected people believe there is a shortage of leadership. For example, in “Where Have All the Leaders Gone?” former Chrysler CEO Lee Iacocca describes with anger the sad state of leadership in the U.S. today. Care: Followers believe that leaders care about them and their organization. Trust and hope: Followers believe that supporting a leader will improve things. Executive leaders must communicate the third component; however, middle-manager champions can exhibit the first two. Experienced analysts realize that applying analytics is not like searching for a diamond in a coal mine or flogging data until it confesses the truth. 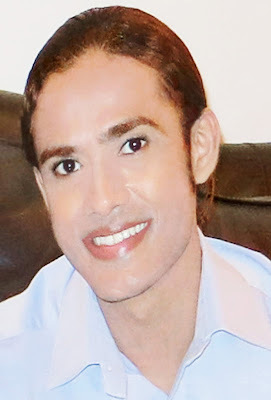 Instead, they first speculate that two or more things are related, or that some underlying behavior is driving a pattern to be seen in various data. They apply business analytics more to confirm a hypothesis than to randomly explore. This requires easy and flexible access to data, the ability to manipulate the data, and software to support the process. This is a form of leadership. Leaders require moral, not physical, courage. An example of physical courage is rescuing someone from a fire. That is noble, but is not leadership. Moral courage is almost the opposite of a rescue. It is doing something not immediately highly valued and potentially perceived as sticking your nose in other’s business. Ultimately it is seen as a helpful contribution to organizational performance improvement. There are hundreds of examples of applying analytics. One is to identify the most attractive types of customers to retain, grow, win back or acquire. Others involve risk management, warranty claim analysis, credit scoring, demand forecasting, clinical drug trials, insurance claims analysis, distribution route optimization, fraud detection, and retail markdown and assortment planning. The list is endless. The investigation and discovery of what will align an organization’s actions with the executive team’s strategy for execution will not come from a CEO with a bullhorn or a whip. Better insights and their resulting decisions will come from analytical competency. Analysts can demonstrate leadership with the passion and desire to solve problems and discern answers – the power to know. Results of a recent survey reveal six areas of priority for CIOs and their organizations: information security and privacy, virtualization and cloud computing, social media integration, data classification and management, regulatory compliance, and vendor management. More than 200 IT professionals — including CIOs, CTOs, chief security officers and IT VPs, directors and managers — were asked to assess their skills and professional development priorities through questions covering three major categories: technical knowledge, process capabilities and organizational capabilities. After analyzing the responses, Protiviti concluded that virtualization and social media integration clearly stand out as the top areas in need of improvement in terms of technical knowledge. And related competencies such as cloud computing and social media security are also top “Need to Improve” areas for IT departments. Some firms have vague or out-of-date social media policies in place that are unenforceable if inappropriate activity occurs. The volume and pace of regulatory change has been significant in recent years, and there are a number of regulatory issues that require IT involvement, including Dodd-Frank, Sarbanes-Oxley, Basel II, Solvency II and PCI-DSS. "IT must be an active part of compliance management, which typically involves developing, implementing or integrating tools and platforms to achieve active compliance and risk management," said Kurt Underwood, managing director and head of Protiviti's IT consulting practice. For every law and regulatory requirement, the company must also ask: What portion of my data does this affect? How do I classify and manage this data in accordance with the law? It also is important to note that, as a byproduct of the proliferation of new and emerging technologies, there are rapidly growing volumes of data being generated daily. By ranking, managing and classifying this data as a top "Need to Improve" competency, respondents may be saying they and their organizations are having difficulty understanding the increasingly complex regulatory landscape and how to comply with various new laws. With more and more organizations transitioning to virtualized solutions as well as applications and activities in the cloud, external service-level agreements (SLAs) with an array of third-party vendors and other providers are a key concern for IT executives. Similarly, determining a sound strategy and approach for outsourcing and off shoring are another critical area of focus, particularly given that many companies continue to seek innovative ways to save costs. However, many of these organizations lack clarity or direction about how to accomplish this effectively while continuing to deliver a high level of service and maintain compliance with company policies, applicable laws and regulations. Because data breaches are costly and affect not just operations but also brand reputation, information security is another top priority for IT executives. Key considerations for leaders to consider are: How robust are our information security measures? Is our organization in compliance with industry standards for security and privacy as well as applicable laws and regulations, and do we have efficient systems and processes for tracking compliance? Google’s mobile revenue? Depends how you do the math. Google wowed Wall Street with the revelation that its mobile business is generating revenue at a run rate of over $2.5 billion. Not bad for a business that’s still in its infancy, and which was operating at a $1 billion run rate at this time last year. Of course, a run rate is not the same as revenue that’s been booked – it’s simply a way of extrapolating what a full year’s worth of revenue will be, assuming the current rate of revenue holds steady. So what is Google’s actual mobile revenue right now? Many Wall Street analysts estimated on Friday that Google generated $625 million in mobile revenue in the recently-ended quarter -– a not unreasonable assumption, given that four quarters’ worth of $625 million totals $2.5 billion. (And since Google said the run rate was more than $2.5 billion, perhaps $626 million for the quarter would be an even more reasonable estimate). Not so fast, says BGC Partners analyst Colin Gillis. There’s no guarantee that Google based its run rate on a full quarter’s worth of revenue. They could have taken mobile revenue from the last month and multiplied it by 12, said Gillis. They could even have used their best single day of mobile revenue and multiplied by 365, he noted. As a result, Gillis estimates that Google’s mobile revenue in Q3 was probably closer to $500 million or $550 million. “We have no idea what that number really is,” he said. Innovation and simplification have become the mantra of high-performing enterprises, yet maintenance and administration costs consume the bulk of most organizations’ IT budgets, hampering innovation and increasing risk. Here’s how IT leaders can get out of the maintenance-spending trap. On average, a typical IT organization’s spending on maintenance and administration is likely to consume at least 70 percent of its annual budget, but higher percentages are increasingly common. While the percentage itself is not that important, the result is. According to a recent survey, only 34 percent of global CIOs think they have achieved anything close to their innovation potential.1 The root cause? It’s likely that, with flat or reduced budgets, IT leaders’ innovation projects have been forced to make do with the scraps left over after they’re done keeping the lights on. If this sounds familiar, you’re not alone. In January 2011, InformationWeek’s Global CIO Top 10 CIO Issues for 2011 noted failure to address the 80/20 spending trap as No. 2 on CIOs’ priority list. Fortunately, some companies have proven that it is possible to drive better innovation performance and “flip the mix” between maintenance and innovation. In 2006, the HP IT team sent shockwaves through the industry by announcing that HP would embark on an ambitious project to transform IT with the goal of delivering improved innovation while delivering increased quality and dramatically lower cost as a percentage of revenue. HP has applied the experience gained as part of its own transformation to help others achieve similar performance, with the Flemish government and Italian Ministry of Education among the ranks of HP customers that have significantly reduced their maintenance costs while delivering game-changing innovation. HP realized that maintenance costs were growing but, to maintain competitiveness, IT’s budget could not. Without an IT transformation to address the maintenance imbalance, innovation would grind to a halt. The drive to innovate is not limited to technology leaders like HP; it’s an imperative for any enterprise that needs to perform better, one that can translate to the top and bottom line. For example, if your only competitors are organizations with IT maintenance costs of 80 percent to 90 percent, then shifting your own ratio even a little can create significant competitive advantage. However you should also consider that startups or companies in emerging markets often jump immediately to modern IT solutions such as converged infrastructure, cloud and SaaS, bypassing ownership and systems-building altogether. What happens as these emerging players, with near-zero maintenance costs, become your competitors? And it’s not just the private sector that’s under pressure to rethink IT delivery. The U.S. federal government also recognizes the imperative to cut maintenance costs. In a recent interview with Fortune magazine, departing U.S. CIO Vivek Kundra remarked that “you would get laughed out of the room” if you went to your board and asked for millions of dollars to build out systems like email, finance and a data center for web site hosting. And yet, he said, that’s essentially what the U.S. government, like many companies, is doing. Making true shifts in spending requires a new mindset in IT. William Dupley, chief solutions manager in HP Canada’s Office of the CTO, likens this moment in IT to the state of the auto industry in the 1980s, when Japanese management techniques shook up American manufacturing. Out of that painful episode came an improved approach to quality management that IT leaders would do well to adopt. “The three key strategies that need to be applied to IT are Six Sigma, Lean and Theory of Constraints,” Dupley says. These eliminate defects or flaws, non-value-add work and bottlenecks, respectively. Effectively leading such far-reaching changes requires visibility across all IT resources and assets. Without an understanding of how all the interconnected parts work on one another, it’s likely that you’ll end up pulling levers without knowing what the outcome will be, jeopardizing not just IT’s transformation, but the day-to-day operations of your enterprise. Visibility into the ramifications of change lets you start adjusting your spending mix. 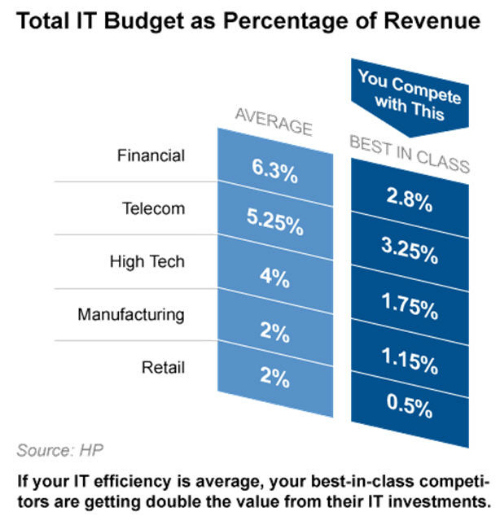 “Best-in-class” typically varies by industry, but HP’s research has found that average maintenance and administration spending is roughly twice that of best-in-class. So how do you move your spending closer to best-in-class? Compare to where you want to be: Work with strategic advisors to assess relevant best-in-class metrics for your market conditions and the steps you’ll take to get there. Discuss your efforts with a community of peers. Once you have a holistic understanding of all the drivers within your organization, you can use scorecard metrics to effect change. With reporting systems such as an executive scorecard in place, IT leaders can combine lagging metrics (the past) with leading metrics (the future) to build insight that helps them make informed decisions sooner. Dupley counsels senior execs (VP and above) to use leading metrics to manage a year out. Combine a quality management mindset with visibility and measurement tools and you unleash tremendous potential for innovation within your organization. For instance, HP customer Delta reduced applications testing times by 52 percent and allowed its testers to devote 90 percent of their time to business innovation instead of verifying legacy applications. Seagate found it more cost-effective to transition its internal email system to a third-party cloud, protecting outsourcing ROI as well as enforcing cloud service SLAs by using an application performance management system from HP. Another of HP’s customers, a Canadian university, transitioned 32 legacy email systems to the cloud, freeing up related staff. By significantly reducing maintenance and administration costs, these and other IT organizations make IT transformation more than just a technology initiative—it’s a business strategy.